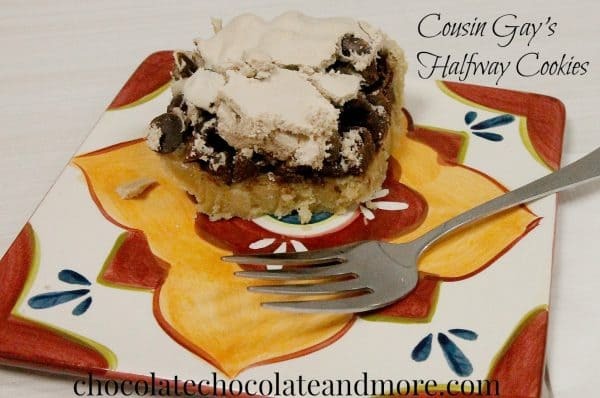 Cousin Gay's Halfway Cookies - Chocolate Chocolate and More! 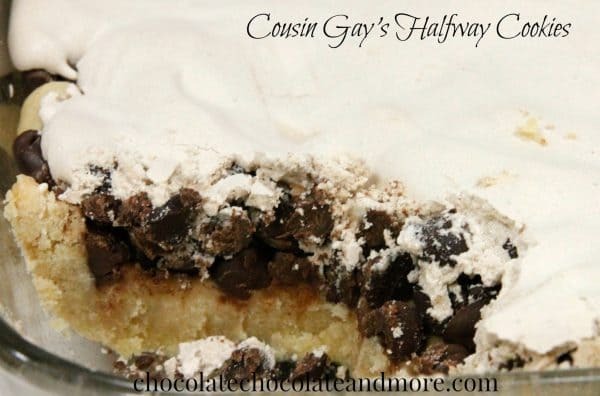 Despite the name “Cousin Gay’s Halfway Cookies”, there is nothing half way about these delicious treats that combine cookie dough, chocolate chips, and meringue. They also are not about Gail Dickinson, even though she is my cousin Gay. This recipe can be traced back at least 70 years to a cousin on our grandmothers side, but a few times removed (you know how Southern families can be.) All we really know is that at some point in the 1940’s, it ended up in our grandmother Quarles’ recipe box, then my mom’s, and then mine. And now, you can add it to yours! This recipe is not for those who are dieting –and also not recommended for anyone who is diabetic. A co-worker of mine who had just a small piece claimed it gave her a “sugar buzz”, and added it was “sweeter than Cadbury chocolate!” The base is akin to a soft shortbread cookie, which is topped with 12 ounces of your favorite chocolate chip (the recipe calls for semi-sweet, but you can substitute any kind you prefer.) The thing that puts the recipe into total sugar overload is the meringue topping, which has two ingredients: egg whites and a cup of brown sugar. When I was a child, my mom would only make this recipe once or twice a year, and I could never understand why it wasn’t more of a staple in our desert diets. As an adult, I can see how giving this to a child would send them on a sugar rush that could take days to come down from, so I would keep that in mind when serving this up to anyone you might need to put down for a nap or early bed time. As for the adults, enjoy with a big glass of milk, or your favorite coffee. I hope you enjoy this enough to keep the recipe, and pass it down through the generations, whether you have a cousin Gay or not! Sounds wonderful but I was just wondering if there is supposed to be any flour in the crust part because the only dry ingredients listed were baking powder, baking soda, and salt … no flour. Looks like a great recipe! I love pecans in everything. Have you tried them in this? Would you recommend adding them to the cake part or sprinkling them in with the chocolate chips? Love your recipes! Thanks so much! I have never added nuts, but I am certain it could only make the recipe better! 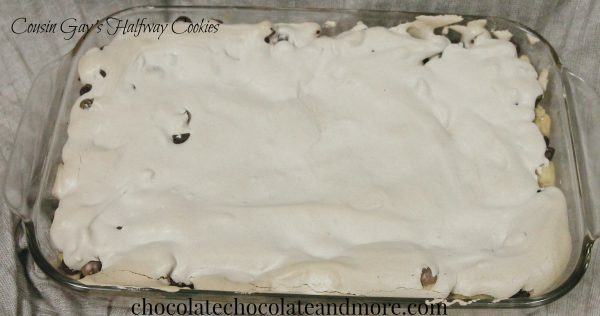 I would say it would be better to add them in with the chocolate chips in the middle layer, because that way you could add them as halves or wholes instead of having the chop them up to mix into the dough. If you try it, let me know how it turns out!! I’m sure our readers would love to see the end result! Confusing – You recommend a non-standard 10 X 10″ pan, but picture shows a rectangular glass dish. What do you use? Sorry for the confusion. The recipe passed to me from my mom calls for the 10″ x 10″ pan, however I wanted to make sure everyone could see the layers of the finished result. I don’t actually have a square clear glass dish, so I ended up using the rectangular one. The only thing it really affected was the thickness of the meringue on top as I had to spread it fairly thin to cover the larger pan. I would recommend using the square pan that is suggested rather than a rectangular one, and if you have an 8″ x 8″ or 9″ x 9″, that works as well — just makes for a thicker cookie. Good news–this recipe CAN be successfully modified with Splenda Blend sugars, to make it a dessert even diabetics can enjoy in moderation. There is both a brown sugar and regular cane sugar blend made for baking (specifically for diabetics to use). I bake with it every time I make anything sweet–my husband is diabetic. And recipes come out tasting great!